The ecobee remote sensors give the ecobee thermostat a unique advantage over its competitors. You can set up these little satellite sensors anywhere in your home to give the ecobee more knowledge of temperature and activity in your home. You’ll have to do a little bit of setup to tell the ecobee3 exactly how to use this information to keep you comfortable, but it’s not too difficult and should only take a few minutes. Let’s get started! The sensors include a motion detector to tell the ecobee3 which parts of your house are active. They also include a temperature sensor so it can figure out the best way to keep you comfortable. 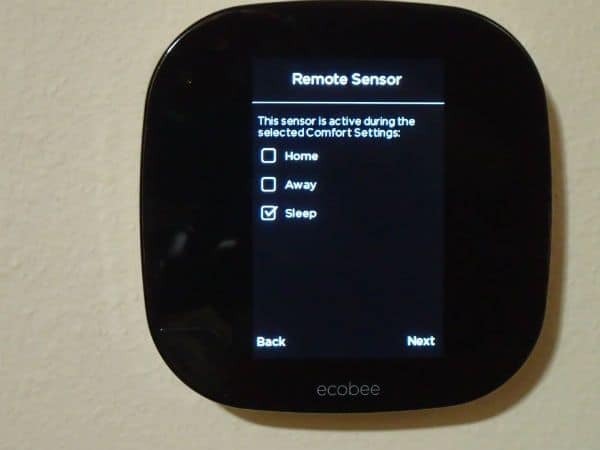 The remote sensors do not include a humidity sensor, but the ecobee3 does. The motion sensors are passive infrared motion sensors. This means they use the natural infrared radiation given off by all objects as a means of detecting motion, and therefore work regardless of light or dark. 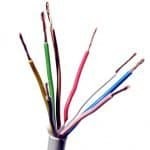 They connect to the base unit using radio frequency communication right in the same range as z-wave. However, unlike z-wave technology which uses a mesh network, they use a star network configuration. 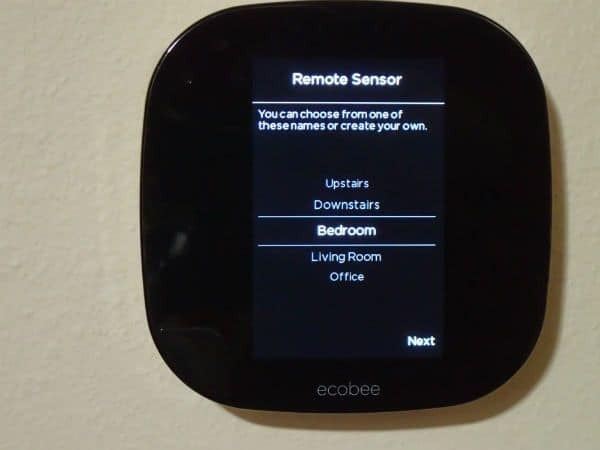 Therefore, all sensors have to be within the range of the ecobee thermostat. The remote sensors run on battery power so they can be placed anywhere you like. The battery is a type CR2032 (the little silver coin shaped batteries). It will run the sensor for 18-24 months. Originally, ecobee advertised a 4-year life, but after some real world feedback, they revised the estimate. They also warn that if a sensor is placed in areas with lots of motion, the battery life will be reduced even more. There is no need to worry about when to replace the batteries because the ecobee3 will tell you when any of the sensor batteries are running low. The maximum number of sensors the ecobee3 can connect to is 32. I can’t imagine ever needing anywhere near that many but if you do, the ability is there. For the vast majority of people, any more than four sensors seems like overkill to me. The base unit itself is a sensor, and the original package comes with one extra remote sensor. If you buy one extra pair of sensors, you should be set. In most homes, the base unit will be in a central location. 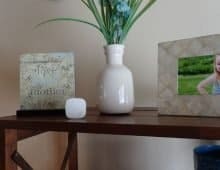 Place one sensor in the master bedroom, one in the living room, and maybe one in an office. 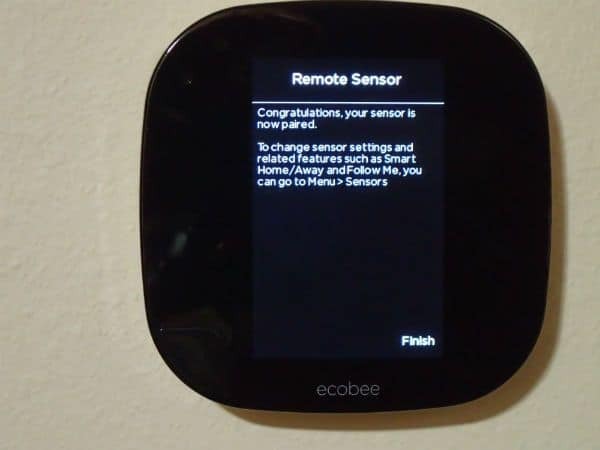 If you place your remote sensors too far from the ecobee thermostat, they will become unreliable or not work altogether. The advertised maximum range of the sensors is 45 feet. The open air range of the sensors is probably 100 feet or more. But, ecobee reports the range as 45 feet to account for the inevitable obstructions that occur your home. If your base unit is in a central location in your home, there is a 90-foot diameter circle that you can place your sensors. That range should satisfy the majority of homeowners. Keep in mind that walls and other obstacles will shorten the range. If you are having connectivity problems, there is a good chance you are on the outer edge of the range. The sensors will not be triggered by every tiny motion event they detect. They are designed with a sensitivity that is supposed to stop pets from setting off the motion detector. Since a sensor cannot detect how far away an object is, a close object will appear much larger to the sensor than a distant object. Therefore, it will take a much larger object to set off the motion sensor at 10 feet than it will at 10 inches. 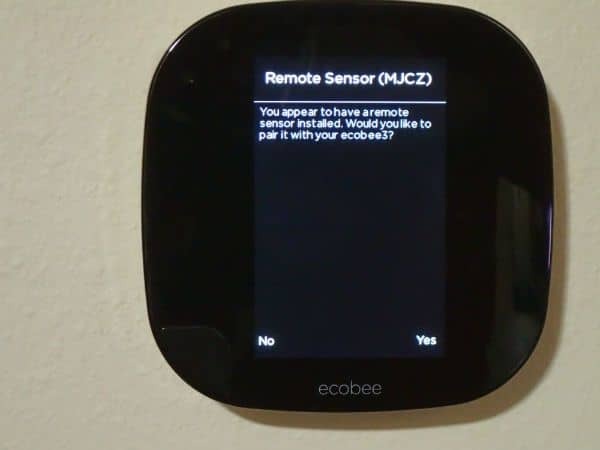 Installing a new ecobee remote sensor is easy and shouldn’t take more than a minute or two. Your new sensor will have a plastic tab sticking out the back. This keeps the battery from powering on the sensor. You don’t want to remove the plastic until you’re ready to connect the sensor. Don’t try to connect the sensor until you have the smart thermostat configured and working. Then, pull the plastic tab out from the sensor. The power will connect and within a few seconds, your screen should switch to the sensor setup screen. Press Yes to pair your sensor with the thermostat. Troubleshooting: If the screen doesn’t pop up, remove the back cover of the sensor and flip the battery around (so it’s installed backward). Let it sit for a minute or so. Then, reinstall the battery the proper direction and it should work. Next, you need to choose a name for the sensor. You can type in your own name or you can choose from a list. I will put this sensor in my bedroom, so I will name it Bedroom. Then, choose which comfort profiles the sensor will participate in. Since this sensor will be in my bedroom, and I rarely spend any time in my bedroom unless I’m sleeping, I will tell the bedroom sensor to only participate in the “Sleep” comfort profile. Don’t worry if you’re not sure which to choose. You can always go back and change it later. Press finish and that’s all there is to it. Repeat the process as many times as you need for each sensor. Once you have the sensor paired, you have to find a place to put it. ecobee recommends placing the sensors about 5 feet high for optimal temperature measurement. For optimal motion detection, sensors should be aimed at doorways and seating areas. The sensors should be oriented so that the little bee is facing up and to the right (just like the picture below). It’s a good idea to avoid putting a sensor directly in the kitchen because the temperature in the kitchen can fluctuate wildly if you are cooking. As you might imagine, this could cause some undesirable reactions from the thermostat. A better idea would be to place the thermostat somewhere on the outer edges of the kitchen. There, it will still be able to monitor for motion in the kitchen, but the temperature it reads will be a much more moderate temperature since the kitchen air will have a chance to be cooled by the other parts of the house. The same sort of logic applies to sensor placement throughout the home. 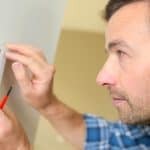 Don’t place a sensor next to a drafty window or right next to an outside door. Don’t place a sensor in a place where it might get direct sunlight. It’s probably best to avoid putting a sensor in the bathroom even if you do spend a lot of time in there. A long hot shower is sure to throw things off. All sensor options and features can be accessed from the sensor menu. 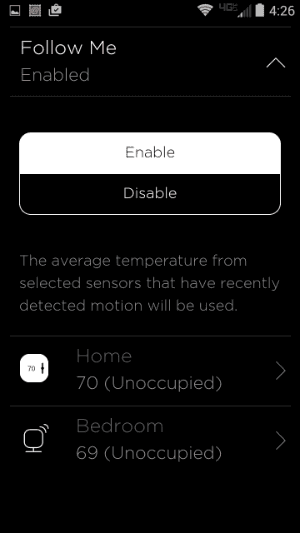 The sensor menu can be accessed from all three device types: mobile app, web app, and the ecobee3. There are three default comfort profiles: Home, Away, and Sleep. Using sensor participation, you can choose which sensors to use for each comfort profile by choosing a sensor from the Sensor menu. Choose which comfort profiles to use for each sensor. For example, I have only two sensors: the sensor in my ecobee3 and a remote sensor in my bedroom. 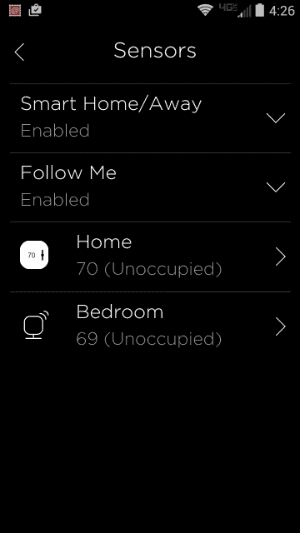 I keep the ecobee3 sensor active for the Home and Away comfort profiles. 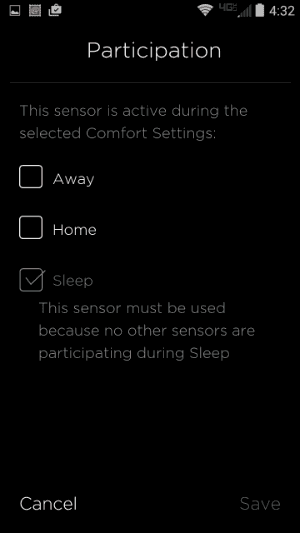 Only the bedroom sensor is active for the Sleep comfort profile. This means that when the thermostat is set to the sleep comfort profile, only the temperature reported by the bedroom sensor will determine whether to turn on the heat or AC. When Follow Me is turned on, the ecobee3 will average the temperature of all sensors that are reporting activity and use that average temperature to determine when to run your equipment. However, it doesn’t instantly average all sensors reporting motion. If motion is detected by a sensor, the temperature of that new sensor is phased in slowly. It will require repeated motion detection over time to be fully averaged in. The good part of this is that if you make a quick trip to a room and leave it again, it won’t make much of a difference. However, the tradeoff is that if you enter a room to stay for awhile, it will take some time to adjust. If you are cooling, the AC will need to work overtime to get your warm living room down to your set point. The rest of the house will get cooled to a temperature lower than your set point and the ecobee won’t care because the only sensors it will be using will be the living room sensors. You will be comfortable watching TV, but you won’t be saving any energy. If you are in heating mode, your warm living room will reach the set point before the rest of your house and the furnace will shut down. You will be nice and toasty and you will be saving a little bit of energy. But, the rest of your house might require a blanket and slippers. I could see this being a pleasant feature at times and also a bit of an annoyance at times. Fortunately, everything is customizable and you can even turn the feature off if you don’t like it. Follow Me can be turned on and off from the ecobee thermosat, the app, and the web portal. If Follow Me is turned off, all the participating sensors’ temperatures will be averaged whether they sense activity or not. In my experience, the sensors are reliable, easy to install, and easy to use. 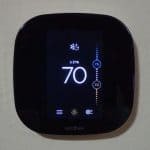 The ecobee thermostat has, in my opinion, the best customization of any smart thermostat on the market right now. The remote sensors only add to that ability. If you order an ecobee3 or ecobee4 thermostat, it comes with one remote sensor. If you need more sensors, you can pick them up in packages of two. 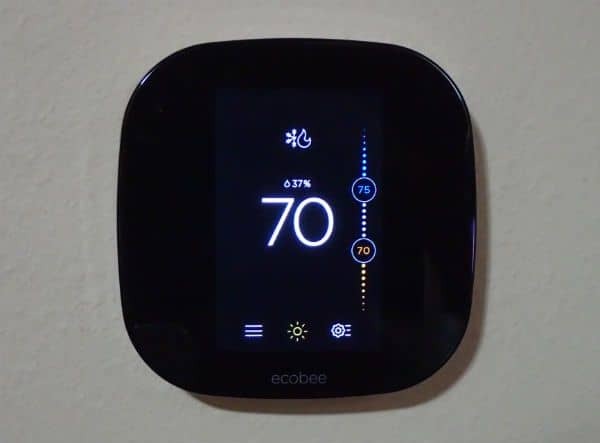 For my more general review of all things the ecobee thermostat can do, click here. 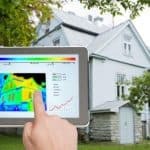 Remote sensor sensitivity cannot be adjusted. Nor can detection latency or detection time out. It can take several minutes for a sensor to trigger, detect motion, and the timeline for determining no motion, detection time out, is indeterminable. These are both settings that need to be included in future releases of the hardware and system software implementation.